Learning wild plants used for medicine, food, and tools is also known as the study of ethnobotany (how people utilize plants). Edible and medicinal plants can provide healthy alternatives to highly processed foods and pharmaceuticals, bringing greater health into our lives. 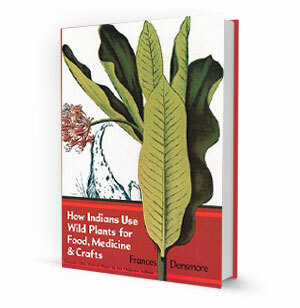 In this book, those traditions are captured, providing a wealth of new material for those interested in natural food, natural cures, and native crafts. Altogether, a worthy addition to the library of anyone interested in wild foods, Native American culture, and life in the early 20th century. Uses and natural cures from nearly 200 plants. Gathering & preparation of maple sugar and wild rice. Preparations for beverages from leaves & twigs from common plants. Plants used for making everyday household items. Plants used for charms & crafts.